Last month on Dice Hate Me, we spilled the beans on the newest project over at Clever Mojo Games – Princes of the Dragon Throne. 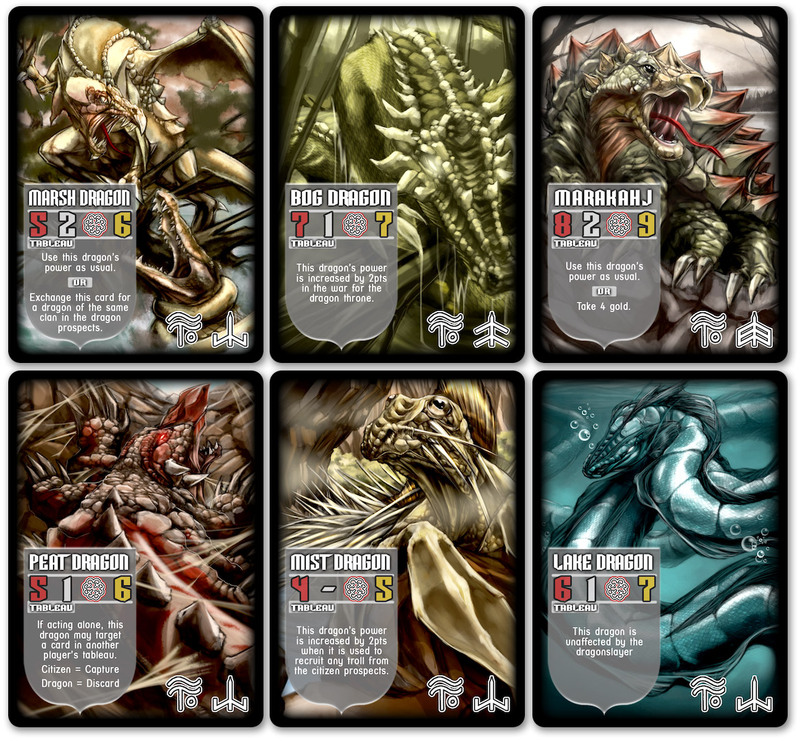 Now – even though this card-drafting game isn’t due out until the end of 2011 - we’re lucky enough to have the first peek at the new card design, as well as some of the fantastic dragon art from trading-card art afficionado Don Aguillo. Check out the sneak peeks below, as well as a special in-house guide to deciphering the dragon cards. We’re not quite sure what it all means yet, but stay tuned to Dice Hate Me for more peeks behind the scenes in the coming months. As usual, click to embiggen the images – there’s a lot of detail to be explored! Also, for anyone wanting to know more about Princes of the Dragon Throne, as well as Alien Frontiers and other Clever Mojo Games projects, look for their booth at the Origins Game Fair in June. I’ll be there to game and geek out, as well – come say hello! “Unlike some deck-builders, PotDT will not use static buy-piles. There are two face-down decks, one for dragons and one for citizens. Each of those decks feeds a line of four or five face-up cards that are available to players. We call these cards “prospects”. If you “recruit” a prospect the cards behind it advance in the line and a new one comes out from the deck. Even this method is not unknown to deck-builders, but what sets PotDT apart is that the lines are continually moving. At the end of your turn, whether you recruit a card or not, you choose one prospect line and the oldest card in that line goes into the “outcasts” and a new card is added to the prospects from the deck. So, there is pressure to carefully examine the merits of cards in the prospects based on their positions because they will not be there forever. I explained all that to give you a little sense of how the standard play works so that you’ll understand a little more about how the Agents are different. An Agent is basically a mercenary-for-hire that you can put to use against your opponents and for your benefit. When an Agent enters the prospect line normal play stops and an auction is immediately conducted to hire the Agent. Players bid from their available gold until a winner is decided. The gold is paid to the stock, the winner takes the Agent from the prospects, and claims the Agent’s Contract from a side deck. The player places the Agent’s Contract in his tableau and then place the Agent into the discard pile of one of the other players. At that point the Agent is like a time-bomb waiting to go off. When the Agent makes it through the players deck and back into the player’s hand it’s effect is triggered and the player holding that Agent’s Contract gets the benefit. The Infiltrator is a Dragon Agent that will cause a dragon from the King’s Army to join your side in the end-game war. If the agent is unable to complete their task (ex: the player has no gold when the Thief comes into his hand) then the Agent goes back to the player’s discards and stays in their deck until he successfully completes his contract. An Agent who completes his contract is removed from the game. There are also a couple of King’s Agents in the citizen deck, to represent the Dragon King’s efforts to stop the impending rebellion. When they come into the prospect line their effect it to harm all players immediately. These cards look nice. It sounds like an interesting game. See what Dominion hath wrought. Deck building is the new hotness even more. Between this, Nightfall, and Thunderstone what will I do. Sounds very interesting. Other good DBGs are Ascension and Resident Evil.